There are many reasons why a husband doesn’t lead his family and today I’m going to uncover all those reasons. The solutions to those reasons will be addressed in future posts. So, if you have a husband who has a hard time leading his family, then subscribe to my site so you don’t miss out on future posts. Maybe he doesn’t know how to lead his home. Maybe he didn’t have a father in his life to teach him what leading a family looked like. Maybe his father was married to a contentious woman, therefore, his dad kept his mouth shut so he could keep the peace in the home. A son who saw this growing up is emulating his father who wasn’t a good role model in leading his family. Maybe he’s a laid back, easy-going, type of personality and leading does not come naturally to him. Maybe he’s been beat down and discouraged by his wife, therefore, he’s apprehensive to take the lead in the family. Again, my fellow wifey-friend, if this is you, you can make some changes and turn your marriage around! Maybe he’s fine with the way things are in the marriage. Maybe he doesn’t realize that his wife feels like he’s not leading! Maybe his and his wife’s roles are not defined within the marriage. Maybe the roles were reversed when he entered into marriage and it’s hard for him to make changes. Maybe he’s trying to change but he’s having a hard time doing so. Maybe he’s not changing fast enough according to his wife. 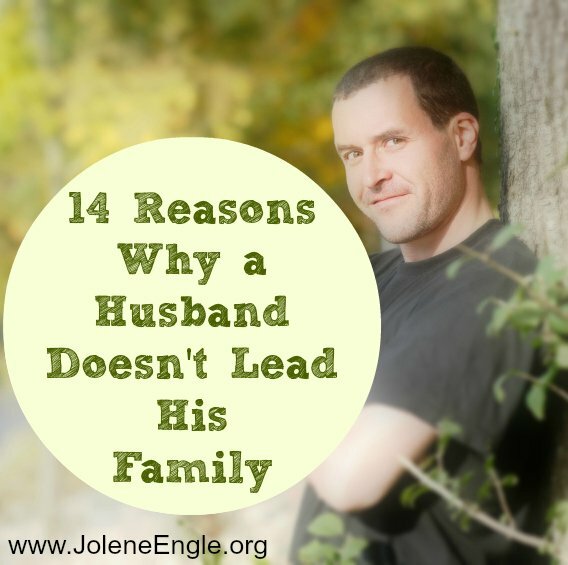 Sometimes we think it’s natural for our husbands to just lead us in the home but that is not always the case! Husbands have insecurities, lack of confidence, poor or no role models, as well as bad habits just like us. The only difference between the two genders is that a man’s struggle/issue will manifest differently than a woman’s. Spend some time talking with your husband and share your heart about what it is that you desire for your marriage, but be careful here. Make sure you don’t beat him up over this issue. Your tone should be filled with grace and kindness, otherwise, your husband probably won’t listen to a word you say or an argument will ensue. See if you can pinpoint some areas that he might be struggling in and then spend time in prayer and lifting him up to the Lord. Ask the Lord to reveal to you areas where you might be able to encourage and strengthen your husband, as well as areas where you need to back off and just let things go in your home life. Next up in this series is, Helping Your Husband to Lead When He Doesn’t Know How. Just writing to say that even though I’m not Christian, (I’m Wiccan/Pagan/Interfaith), I’ve found a lot of value and wisdom in your blog here. Thank you for sharing your experiences. There are very clear scripture on leading throughout the Bible including consequences if a man doesn’t lead. When a man is saved he is now a new man in Christ therefore he puts off the old man. We all had rough back grounds in one way or another and we call this sin ( born sinners) The fall in the garden is a part of everyone. It is through Christ alone we are saved , not by our good works but by the shedding of His blood on the cross.Although good works should follow our salvation. We cannot fix ourselves nor can we go back and relive the past but we can repent and turn to Christ , the Christ that dwells in us therefore it is through His grace, and through the word and prayer that we concuer sin. I would find it a cop out to say that men don’t lead because our wife did something wrong or my childhood wasn’t ideal, no, when you are washed clean whiter than snow then you put that sin behind you and seek His truth. We are all born of sin and the speck in others eyes won’t take the log out of our own. This applies to the women also. I say tell people to read the Bible and they will find it all there. Some men find it very difficult to read the Bible, such as my husband, or any big book for that matter. Your right in what you say about the old man being left behind in the old life and becoming a new man in Christ, beginning a new life, yet its not that easy. You’re not automatically transformed into a totally different person overnight when you accept Jesus and read scripture and the memories of the past are still there and still can have a hold on someone even after conversion or even baptism. A recovered alcoholic may very well have urges afterwards, etc. Things take time. Of course men should be encouraged to read the Bible and it certainly does change lives, I agree. It’s not wrong to say so, however, to identify things in one’s past that have a direct result in why we are the way we are today is a huge step in learning how to overcome it with Christ as our captain in life. With God all things are possible and often times wives need help to see how their role in a marriage is affecting it whether it be positive or negative and there is nothing wrong in shedding light on the partner’s actions as well. It might not just be the husband and more times than not it isn’t.